This particular example, Lando Calrissian in Skiff Guard outfit, is simply labelled "83 Lando" on the card. The vendor, SMILE, produced significant amounts of toys, both SW and non-SW, for Kenner during the vintage era. 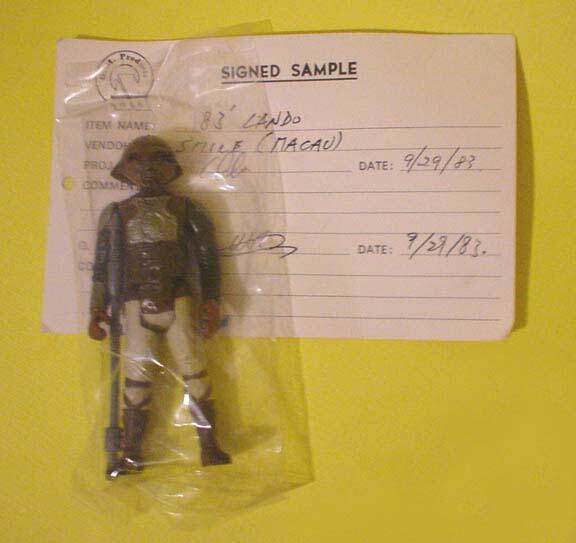 No notations exist in the comment section, signifying this figure likely met the Kenner's Quality Control/Quality Assurance standards when reviewed by Kenner engineers. The Lando Skiff bagged production sample surfaced amongst a find of these dating back to the late 90's. The majority of these samples featured on the Archive stem from the find referenced above. Over the years they have become permanently nestled into private collections, thus they typically do not surface on the open market nowadays.